60 PowerOne Mercury Free Batteries, Size 675P Cochlear Implant Zinc Air Hearing Aid Batteries. (60 batteries Comfort dial pack, 10 cards of 6 cells each). VARTA Microbattery with its brand Power One has over 100 years of experience in developing innovative battery technologies. 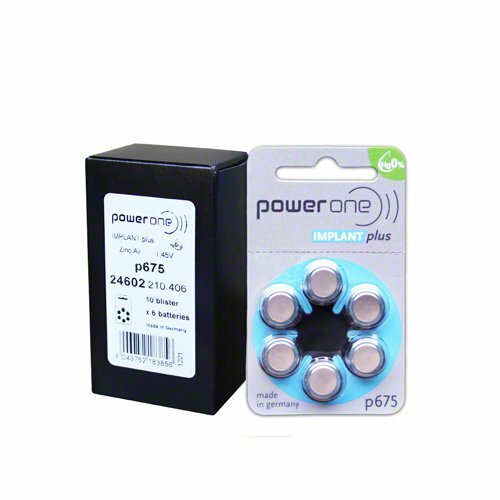 Featuring with its consumer-focused extra long tabs, Power One batteries are manufactured at the world's most up-to-date and biggest production site for hearing aid batteries in Ellwangen/Germany-well recognized for manufacturing quality and detailed precision. Subject to Germany's stringent safety guidelines and quality checks, every cell is tested for its electrical and mechanical characteristics in compliance with its specification. Quality seal on back ensures that the batteries have not been tampered with. Long lasting with an extra long tab to facilitate easy handling.